My vision for our daughter's nursery was a soft, cuddly and cozy room filled with an eclectic mix of items - old and new, purchased, hand-made and found. I used a pale powder blue, cream and whites to create a super soft feeling in the room. She has a new cream spindle-style crib and a large swivel rocker (both from Pottery Barn) along side antique pieces of furniture. 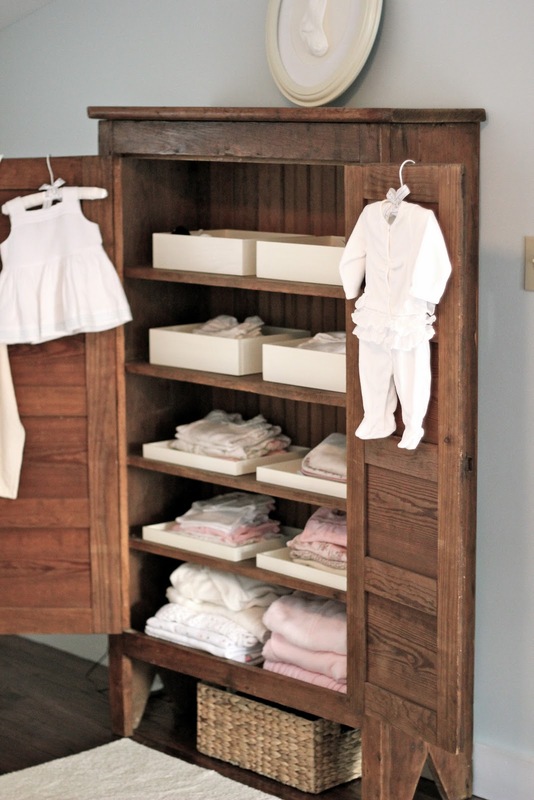 We're using an old Pie Safe as an armoire to house her growing collection of clothes and a Blanket Chest doubles as a changing table. Emma enjoying her playtime in her crib with all of her friends, including an old pal of her Dad's, "Teddy" the blue bear. This Pie Safe used to be in our old living room, but now it works perfectly to house her collection of clothes. It is amazing how many clothes she 'needs' - we seem to go through them all at least once week! This chair has been a life-saver. It's grand size is perfect for the three of us... Me, Emma and Mr. Darcy. He likes to jump up here with us. I debated on getting the smaller version of the chair (Pottery Barn Kids), but am so glad we got the "Grand" size because it will grow with us - it will be nice to have a chair we can both fit in for storytime when she gets older. Emma loves all of her lambs and sheep - she can't wait until she's old enough to try out the rocking sheep she got from Santa. I made the drapes and crib skirt out of felted wool. We had the 12 x 8 cream carpet made at Home Depot... did you know that you can have any of their carpets turned into an area rug? We chose a super soft cream carpet that would be great for her to play on when she gets older. This sheep mobile (Pottery Barn Kids) was a shower gift from my sister Jill. It really adds a touch of whimsy to the room. I love the 'hand-made' looking quality it has. I was at a loss for 'artwork' in her room. We had received so many adorable socks and booties as baby gifts, so I decided displaying them and other items of clothing would be perfect. I left them open without glass so I could easily swap out new socks, or put up a photo or memento. DIY instructions to come. 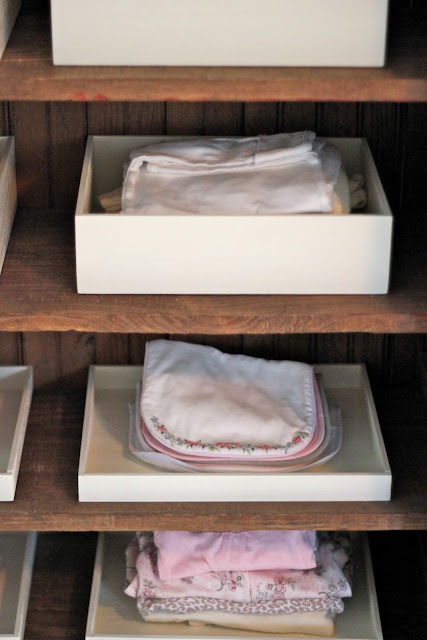 Mike painted these wooden boxes (and their tops) to serve as trays to keep her clothes organized. Here is one of the box tops with a stack of her onsies. And more socks! Don't you love those pink and white courderoy booties? They were made for us by one of Mike's Mom's friends. Mike is obsessed with them - they ARE super cute. Instead of a diaper bag, I chose a Vera Bradley tote. It is perfect - has lots of compartments lining the inside, it is a great size (hello carry on...) and it is washable. Mike and I made the ottamen (for $50 - DIY coming soon!) I still can't decide what to do with the legs. Paint them? Stain them? Leave them natural? I had originally planned to put a skirt on it, but have held off because I kind of like it how it looks now. Work in progress! awww. this realy is a cute nursery! Baby Emma has a dream nursey ! YOu did a great job, I love every bit of her room. We definitely have similar tastes! i am so glad you posted about hone depot being able to cut a rug, that's amazing. I am definitely looking into that now! what a treat to see this morning!! 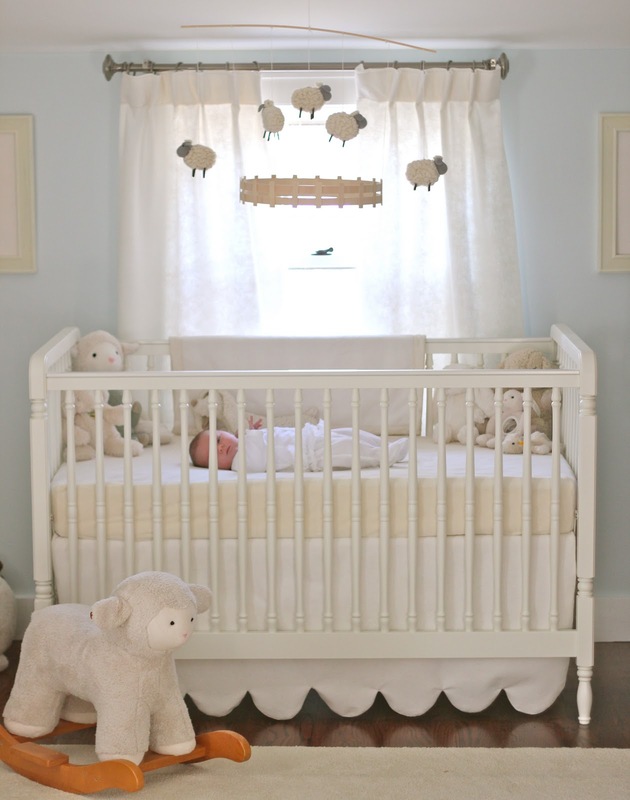 her nursery is calm, cozy, and beautiful. well done, mama!! the nursery is gorgeous!!! 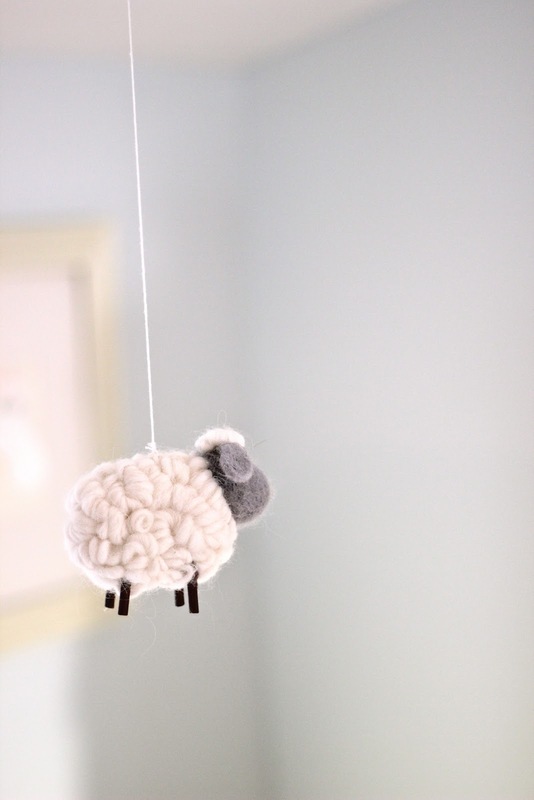 i was contemplating ordering the sheep mobile from PBK, too--would you recommend it?? I love this, Jenny! It's so simple. So calming. So sweet......Everything a new baby needs! this is such a beautiful and relaxing space! i love love the sheep mobile and the pie safe is such a great color of wood, and contrasts the pastels nicely. plus, definitely some awesome storage - the clothing collection will only continue to grow! It is so beautiful! It will be a perfect room for her to grow up in. My baby room as a child was a light blue and I have always loved that color for girls. LOVE, LOVE her nursery! If you don't mind me asking, the vintage looking quilt/blanket on the ottoman... is it new by chance? I would love to own it! Oh my...thanks for sharing! It is every bit as lovely as i had suspected! Love this little nursery! Where did you get the lamb rocking chair? Absolutely love your nursery! Do you mind me asking where the ABC pillow on the glider is from? So pretty! What a beautiful nursery, and such a cosy looking cot, look at the depth of that mattress. She is a beautiful baby, may she bring you many years of delight and happiness. The Rocking Sheep is from Santa (...Pottery Barn Kids). Cami - The ABC pillow is from Pottery Barn Kids. Beautiful nursery! What is the paint color? I love everything about your blog! Simply adorable nursery. What color paint is that on the nursery walls? Beautiful! Emma's nursery is lovely, and she is a beautiful baby. I've been following your blog for a few months and so enjoy it. We have similar interests (cooking - and eating - good food, home decorating, DIY projects...). I have two little girls myself who just turned 1 and 3. I'm a transplant to this area too and so your recent "View From Where I Sit" post really resonated with me. I live 10 min down the road from Concord in Carlisle but spend a good bit of time in Concord. My older daughter will be going to preschool there next year. I think we must have some mutual acquaintances too, as I saw your name on a FB invite to the girls' nights in Concord, though I haven't actually made it to one yet! Anyway...just wanted to tell you how much I look forward to your posts. I'm now especially looking forward to the ottoman DIY! Hopefully our paths will cross sometime out and about in Concord. I'm in North Acton with 2 girls also (though a little older). This is a great area to live in. This nursery is so gorgeous! Soft and sweet. 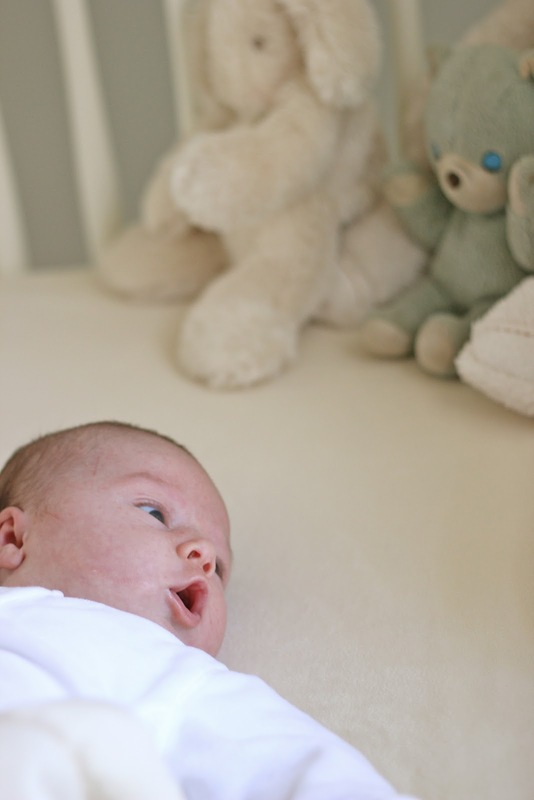 My little girl arrived on December 30 and I too used blue in her nursery. Love it. Congratulations on your gorgeous sweetie! Great quality and prices and most importantly unique and adorable items! Beautiful!!!!!! Please do share the paint color??? Do you remember the name of this crib? I'm pretty sure Pottery Barn Kids doesn't carry it anymore, but I'd love to try to do an online search and see if I can find one. It is EXACTLY what I'm look for! 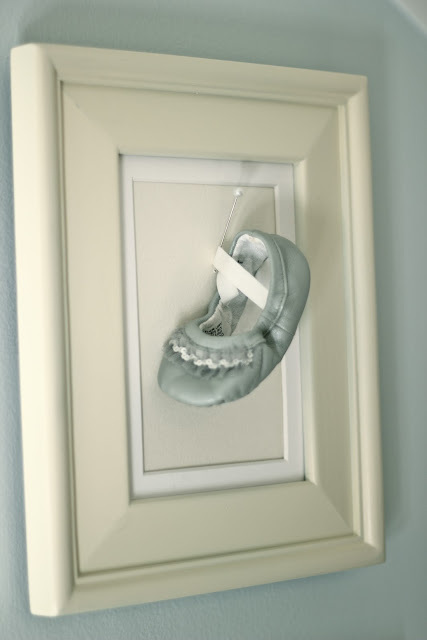 i came across a picture of your nursery on the internet and have been dying to find the original poster - thank goodness for pinterest! i ADORE your nursery. we are having a baby boy this christmas, and i have been pulling together antique pine furniture, a white jenny lind crib, a lamb mobile, and framed baby clothes of my grandparents to put in our blue nursery - when i came across your picture with the scalloped bed skirt, i saw my vision already come to life! i had even found an antique pine wall shelf with a carved scallop detail! sweet emma in her crib is now my #1 inspiration photo as i start pulling everything together over the next few months. so excited to have found your blog! i'm so curious what you do when you receive brightly coloured baby clothes as gifts?? Beautiful nursery! Would you share the brand/color of paint you used? It's the perfect shade of soft blue. Love! Jenny- you did such a great job with the nursery! Would you mind sharing where you found your drapery pole? I'm struggling to find one similar. what is the sweet paint color you used for the walls? I absolutely love this nursery. Thank you for the inspiration! I noticed that a few other readers asked this too but I couldn't find a response. Do you remember what color paint this is? It's perfect! By the way.. 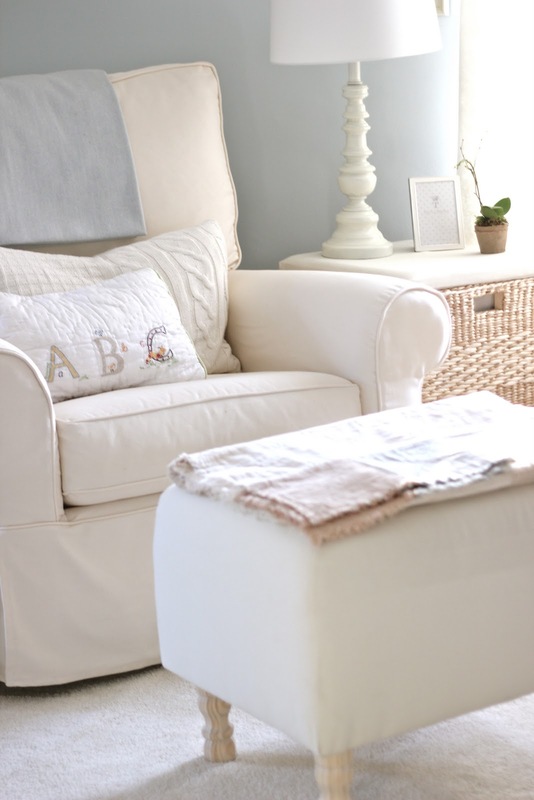 I lvoe this nursery and I also love your updated one. You are in incredible designer. The only thing cuter than the nursery.. is your adorable little Emma! What is the paint color that you used for the walls? Where did you find her crib skirt???? I loveeeeeeeee it! Please do tell!